Noémie Raetzo joined LALIVE in 2017. Her practice focuses on domestic and cross border litigation. She is a member of the Geneva Bar Association and the International Association of Young Lawyers (AIJA). Prior to joining LALIVE, Noémie Raetzo trained with the Geneva Court of First Instance and with Fontanet & Associés. She took the Bar in 2016, ranking first of her class. 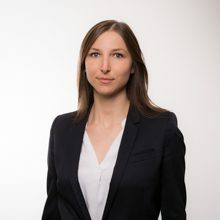 Noémie Raetzo graduated in 2014 from the University of Geneva with a Master in Law and a Certificate in Transnational Law, having spent a year studying at the University of Zurich.